It’s a reusable shopping bag. It’s a backpack. It’s both. If you’ve ever carried heavy shopping bags for any distance, reusable or not, you’ve surely experienced hand-gouging discomfort from the straps. 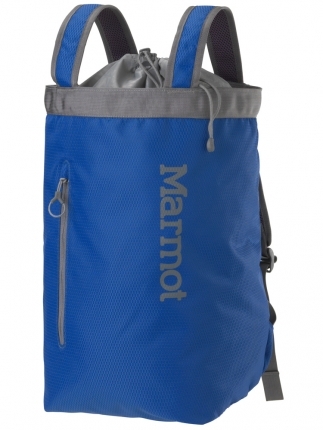 The Marmot Urban Hauler gives you the flexibility to carry the load on your back or tote it like a traditional bag. This lightweight (12 ounces) and relatively inexpensive ($45 to $50, depending on size) “bag pack” features only a single set of straps, which run from the bottom, through two loops above your shoulders, over the wide draw-string opening, and then attach to the top front of the pack. This innovative and smart design allows you to pull the straps upward and use them as carrying handles. When you use them as traditional shoulder straps, they automatically pull the top closed and closer to your body for a more comfortable fit. Light padding on the back adds additional comfort. (One drawback: The straps are slightly more padded than the handles on a canvas bag, but still dig into your shoulders under a heavy load.) You can see it in action in this video from Zappos. The bag is essentially one large, high-capacity sack. With a volume of more than 1,600 cubic inches for the medium, and a whopping 2,200 cubic inches for the large, it offers more space than reusable shopping bags. Or, as one reviewer on Amazon puts it (with an important caveat): “It’s huge. You could carry a toddler in this pack if you wanted to. I got the Large, don’t really carry a baby in it though. It’s really not meant for that.” As a bonus, it features a small zip pocket on the front to store a few smaller items of gear (pacifier? ).